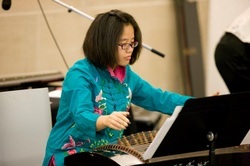 Jing Zhou is a composer, and guzheng performer. She fuses new and bold musical ideas with her traditional Chinese musical heritage to create a distinct compositional style. She is currently pursuing her Doctoral degree in composition at the University of Missouri - Kansas City, where she studies with Zhou Long, James Mobberley and Chen Yi. Previously, Zhou completed her Master’s in composition at the New England Conservatory of Music (under John Mallia and Michael Gandolfi) and her Bachelor’s in composition at the Central Conservatory of Music in Beijing (under Tan Jianping and Xu Changjun. She was a finalist in the ASCAP Morton Gould Young Composer Awards in 2011 and one of the winners in the Young Composers project of Beijing Modern Feistival in 2012. In writing a piece for flute, clarinet and guzheng, I decided to play on various elements of Chinese artistic traditions that had been developing in my mind over time. I imaged the clarinet as a xiao and the flute as a dizi, the Chinese wind instruments that often performed with guzheng as part of a standard instrumental group in China. Mei Lan Zhu Ju refers to a famous group of Chinese plants: plum blossom, orchid, bamboo and chrysanthemum. This group is sometimes known as the Four Gentlemen among Flowers, with their respective characteristics being proud, quiet, firm and light. Since ancient times, these flowers have acted as spiritual symbols for the Chinese, for whom they reflect personal feelings and ideals. Over hundreds of years, and through various many dynasties in Chinese history, poems and paintings have been created under the direct inspiration of these four “gentlemen”, and this musical work follows in that same vein.